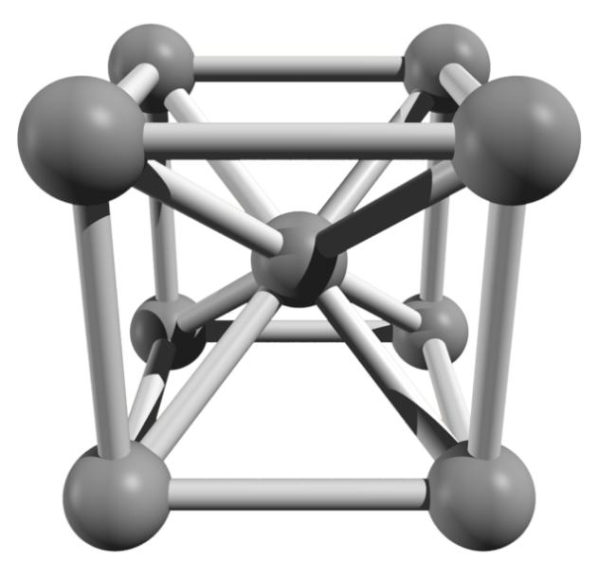 If the atoms are arranged at the lattice corners as well as another one in the center of the body, this is referred to as body-centered crystal lattice structure.The cubic body-centered elementary cell has 8/8 corner atoms (the corner atoms belong to 8 elementary cells each) and 1 centered atom; this is a total of. atoms per elementary cell. The packing density is 68% (body completion). Examples are iron (at room temperature as ferrite in the iron-carbon diagram) and chromium, tungsten, molybdenum, niobium.